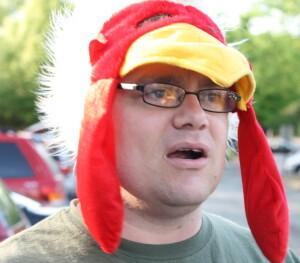 and a group of friends unofficially referred to as The Chickenheads, a group of friends who sat together, known due to Brad DeMunbrun wearing a silly rooster hat to the first game and games thereafter. While the groups sat together and joined in on some common chants, there was little cohesiveness during the first game. At the second game, all the groups were together during the pregame tailgate, sharing beers, stories, and kicking around the ball. 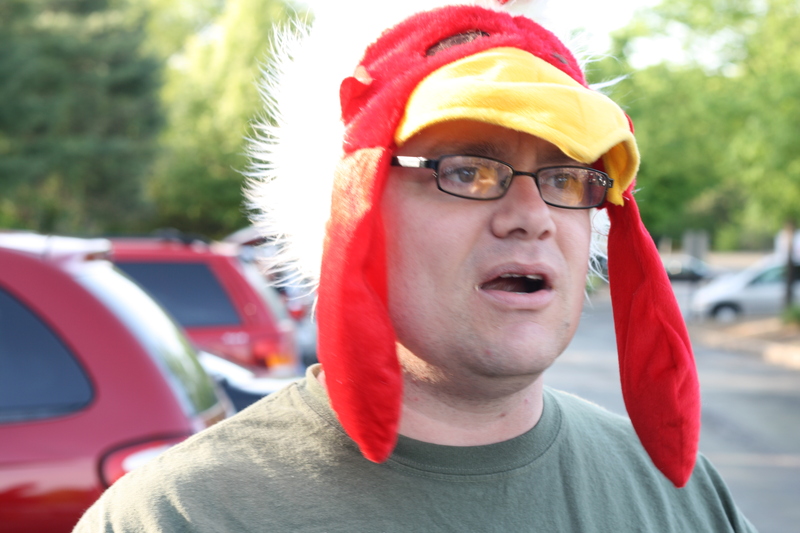 There seemed to be more cooperation during this game, and Brad’s silly Chickenhead hat was becoming a humorous focus of unifying the groups; it was easy to tell people “we’re near the guy in the Chickenhead hat”. Sadly, the club soon started to show the cracks of the mismanagement. The attendance reflected the financial backing, declining quickly. Soon all those above groups were reduced in membership showing up. The remaining participants were still all tailgating together, joining together during the game, even post-gaming together. A lot of discussions were going on about unification under one banner. Brad came up with the name “Saint Louligans”, and everyone was immediately behind it. 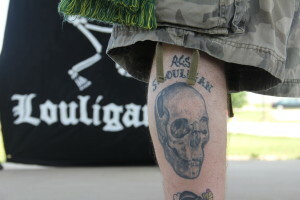 Shirts were soon made; Kyle Scarborough, of the River City Saints and a local tattoo artist, had the logo artistically interpreted as a tattoo on his calf. The group was a hit; the group’s green shirts sold quickly, and showed unification in the corner. The unified group brought in new people to the games, and many of the men’s team fans started going to the St. Louis Athletica games until they folded. Most importantly, the team responded well to a stronger supporters’ group. After the final whistle, the AC STL players always headed over to the supporters’ corner. In a game against the Austin Aztex, the 16 year old phenom Luis Gil put in the game winner in stoppage time,and sprinted right for the corner, jumping into the arms of Kyle Scarborough and the other Louligans in celebration. 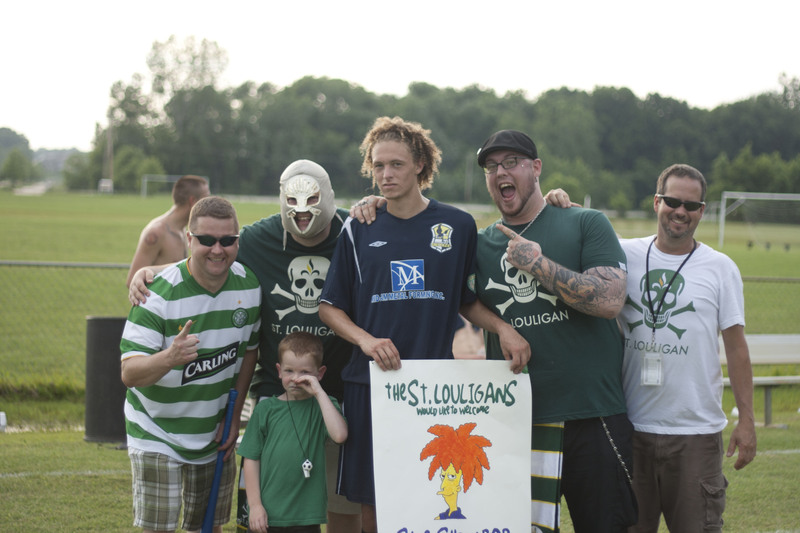 Defender Jack Traynor, captain of AC STL, sat with the Louligans during a one-game suspension. The special bond between team and supporters was established. Sadly, the team’s economic foundation wasn’t established, and AC St. Louis quietly folded. Although there was no longer a professional team to support, the St. Louis Lions, a USL-PDL franchise located in St. Charles, welcomed the Louligans. The PDL (Premier Development League) is the top amateur league in the US, and is considered the fourth division of US soccer (MLS, NASL, USL-Pro) and equal in status to the NPSL. 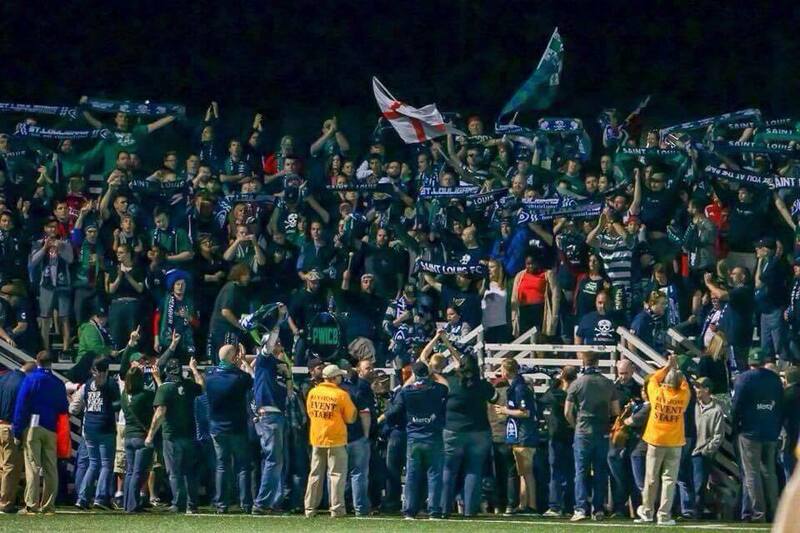 The Louligans picked up where they left off, establishing an immediate presence in the stands and with the players. Fourth division teams don’t have the budgets of larger clubs, so the mindset became more grassroots than before. The first Louligan scarf was sold at this time, the first episode of the podcast “This is Silly With the Louligans” was recorded, and the CafePress store was opened. The impact of the Louligans was felt immediately; Lions officials were approached at the USL National Meetings in the offseason by other teams, inquiring how to establish a relationship with your supporters like the Louligans. Their reputation had spread outside the Lions’ division by their competition. Opposing players knew the Louligans, understood the banter was fun in the spirit of the game, and often remarked “we wish we had fans like you”. The Louligans also started supporting an indoor team: the Illinois Piasa play in the PASL. Run by a Louligan, Matt Williams, the Louligans were encouraged to bring a different brand of silliness to the indoor games. Piasa’s opposition is often aware of the Louligan corner at Piasa games; the pounding on the glass and volume carrying in an indoor setting brings an energetic support to the Piasa players. Sadly, the Piasa stopped operations in 2014. In late March, 2013, the St. Louis Cardinals announced at a press conference the May 23rd game where Manchester City would play Chelsea in Busch Stadium. A contingent of Louligans were in attendance at the press conference, and recognized by some in attendance as part of the St. Louis soccer infrastructure. 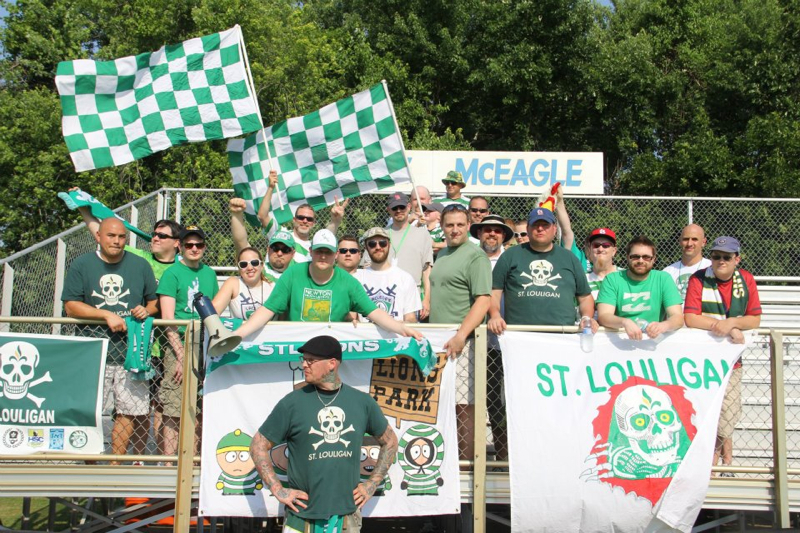 The Louligans in attendance were introduced to many St. Louis soccer luminaries; one of the most exciting introductions was to the owner of the newest team in the St. Louis area. Fire and Ice SC is a women’s team in the WPSL; F&I is composed of amateur players, with similar restrictions to the Lions in the USL-PDL. Their first season was 2013, and the ownership and coaches were enthusiastic about the Louligans bringing a supporter’s culture to the stands. The leadership of F&I has taken a very modern approach in working with the Louligans, and have shown their appreciation on and off the pitch. The players even made direct efforts to help the Louligans recruit for attendance. A unique relationship again reflecting the strength of cooperation with a supporter’s group. But then, on May 1, 2014, USL Commissioner Tim Holt came to town, and announced that St. Louis would have the next franchise in USL (formerly USL-Pro). Future GM of the team, Jeremy Alumbaugh, reached out and stressed the importance of having the Louligan presence at the games. Now known as Saint Louis FC, the team incorporated the passion of the Louligans into the gameday experience, putting the supporters in early ads, near the scoreboard during games, and having unique promotional gifts for Louligans as season ticket holders. The group finally had returned to the professional soccer level, where it all began.